Did you know a chicken, a panda and a coyote are Uptown’s favorite and most loveable yet odd pets? And these last few days of July and until August 15th you get your chance to spend some time with these lovely creatures, a duo of huge bonuses and 350 Free Spins! 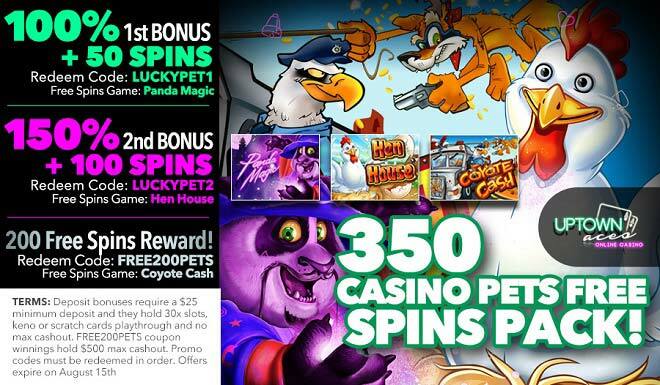 You’ll be collecting wins as soon as you make a deposit of as little as $25 to claim a 1st 110% Match + 50 Panda Magic Spins, continue on to a 2nd 150% Bonus and 100 Hen House Spins and top off your outlandish Uptown pet experience with a 200 Coyote Cash Free Spins Reward! Cuddle up with these eccentric Uptown pets and many wins when playing with 350 Free Spins!